Don't miss the lecture on "Taking Social Development at heart with biobased solutions" by SBE member, Prof. Patricia Osseweijer (TU-Delft & BE-Basic, the Netherlands). In recent years there has been a rapid expansion of the growing of crops for use in bioenergy production rather than for food. This has been particularly the case for sugarcane in Latin America and Africa. 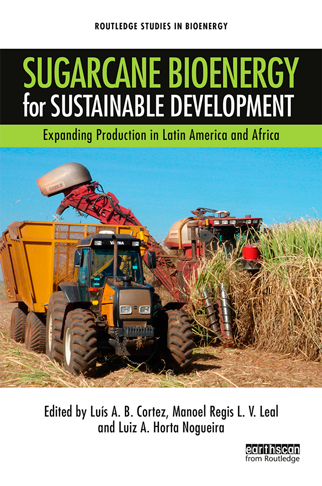 Sugarcane Bioenergy for Sustainable Development examines the further potential for this in the context of the food versus fuel debate, and as a strategy for sustainable development, with case studies of two countries, Colombia and Mozambique. The book will be of great interest to researchers and professionals in energy and agricultural development. The General Assembly of the Bioenergy Society (SBE), convened at its headquarters at NIPE/UNICAMP in Campinas on December 4th 2017, ​elected the new Board of Directors, Fiscal Council and Administration Council for the 2017-2021 term. Prof. Luiz Augusto Horta Nogueira, from the University of Itajubá, was reappointed President of the Executive Board. Encouraged by the success of the last edition of the BioEnergy Science and Technology Conference (BBEST), that took place in October 2017, the new President has plans to expand the scope of actions of SBE in the upcoming term.